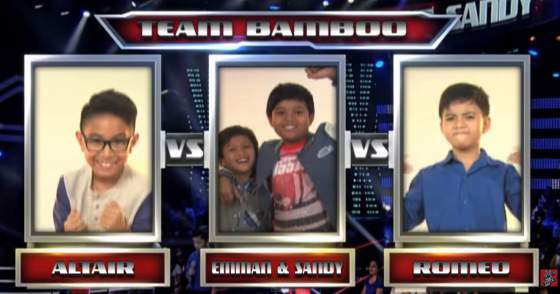 VIDEO: Altair defeats Romeo and Emman & Sandy in The Voice Kids Philippines Battle Rounds - Balita Boss! Team Bambo young aspiring singers Altair Aguelo, Emman & Sandy Tanyo and Romeo Espino sang "Billionaire" by Travie McCoy featuring Bruno Mars on The Voice Kids Philippines Season 2 Battle Round, Saturday, August 1, 2015. Coach Sarah picked Altair while Coach Lea chose Emman & Sandy. Coach Bamboo selected Altair, the 11-year-old 'Pusong Pinoy Singer from the USA,' as the winner in the three-way battle. He will advance to the next round of the competition – the Sing-Offs.